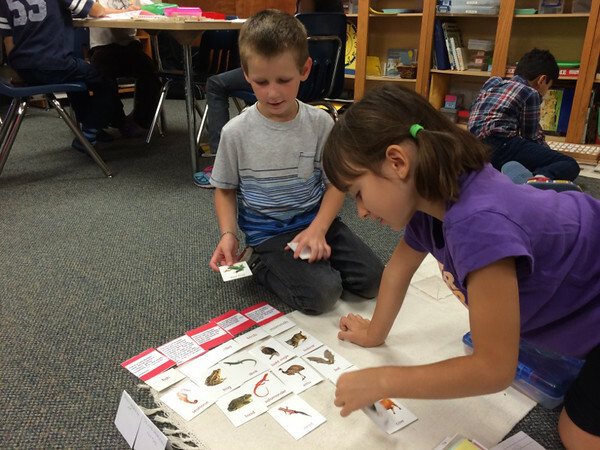 Children at work in the Montessori Elementary class. October is observation month at our Montessori school. Now that the classrooms have been up and running for six weeks and the children are mostly adjusted to being away from their parents, we invite the parents to spend 15 minutes in the class just observing to see what their children's days are like. Parents are given a clipboard with an observation sheet that asks some general questions about what they see. After class, the teachers read over the observation sheets and respond to any questions or concerns the parents may have at the upcoming Parent/Teacher Conferences. Observation month is offered again in April. Parent observations are important to the teachers because they keep us focused on our own observations. "I'm seeing that this child rarely chooses to work by himself. I wonder if his parents will see the same thing? Is that how he is at home or only at school?" Observations are important to parents because they can serve as an informative window into a child's day. "I didn't realize she had so many friends at school. Does she ever work by herself?" Observations are also important to the children because every child enjoys when Mom or Dad come to visit. "Mom's at MY school watching ME work??? Awesome!" Being a part of your child's day promotes good feelings and almost guarantees terrific dinner conversation. Children at work in a Montessori preprimary classroom. So what can you expect during your in-class observation? Your child is going to notice you. If MSGL had the facility of its dreams, each classroom would have a one-way window that would allow you to observe your children from the hallway without changing the dynamics of the class. But, we have the beautiful facility that we have, so we can only offer in-class observations. Your child, especially a very young child, may want to spend the whole time sitting with you and that's okay. You can remind her that she should continue doing what she was doing before you walked in, but don't push the issue. Tell her that you are just watching and not talking, and that may help. With so many children in the class, there is plenty to observe even if your child is sitting on your lap. The teachers will be busy but not in control of the classroom. They will greet you politely then get back to their jobs of presenting, observing, and responding to the children. Children will be doing lots of different things. Some children will be working with Montessori materials, others will be drawing, others will be having snack, and still others may be pouring beans into the dishwater. When you see things that make you curious (or even anxious), write them down! The teachers would love to discuss them with you at conferences. You will see many good things. Ask yourself, are children Concentrating? Cooperating? Leading? Following? Smiling? Laughing? Moving gracefully? Being polite? Write those things down, too. There will, occasionally, be chaos. The children may be adjusted to being away from home after six weeks, but the classrooms are far from normalized. Many children are still learning how to work independently, to share space and materials with others, to care for themselves in the bathroom, to join in group activities peacefully, and to clean up after themselves. Within the span of a 15-minute observation, dozens of things can happen that the teachers would prefer did not happen at all, let alone in front of innocent parents! But this is also the reason we invite parents in so early: we want you to see the tremendous changes that take place - in the classrooms and within the children themselves - between October and April. 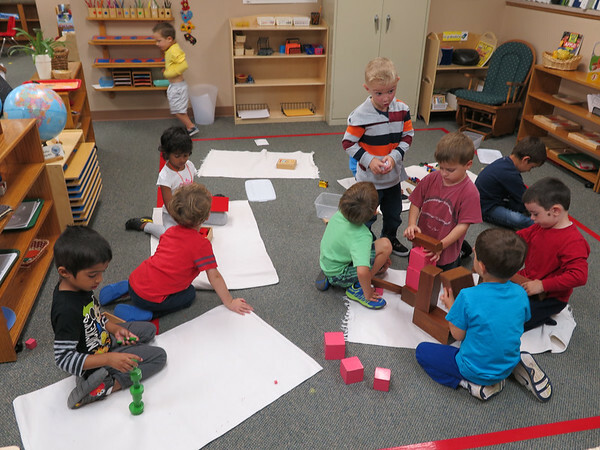 Children working in the Montessori toddler classroom. ​ ​Sign up for an observation time outside your child's classroom. We look forward to seeing all of our parents in our classrooms! Miss Emily tries out a science experiment during the Teachers' Silent Journey and Discovery. Have you ever wished you could experience Montessori through a child's eyes? We would like to offer you the next best thing. Please join us on Monday, September 22nd from 6:00 - 7:30 pm on the MSGL campus for the Montessori Silent Journey and Discovery. This is your opportunity to see the classrooms as your children do and to use the same materials they use to develop their bodies, minds, and spirits. The Montessori Silent Journey and Discovery will take you on two guided tours of the school, starting as an infant and progressing through the Toddler, Preprimary, Extended Day, and Elementary classes. The first tour is silent. Your tour group will spend 5 minutes in each room looking at - but not touching - the classroom environment and the various materials. After the first tour, your guide will once again take you to each of the classrooms, but this tour will be the Discovery portion when you can use the materials, ask questions of the guides and teachers, and take part in the teachers' presentations. We will wrap up the Montessori Silent Journey and Discovery by gathering together for refreshments and discussion afterwards. Miss Stacie presents the Squaring Chains. We are very excited to offer this new parent education event and we highly recommend it for all new families and anyone who would like a hands-on experience in our Montessori classrooms. This is also a nice tour for grandparents and caregivers. The teachers practiced the Silent Journey and Discovery in August and really enjoyed the experience. You can read about one parent's experience with a Montessori Silent Journey and Discovery on the I Heart Montessori blog. Childcare is available for children ages 2 and older who are currently attending MSGL or familiar with MSGL. All of our teachers will be on hand for this special evening and we look forward to seeing you there, too! Please register for this fun event and sign up for childcare in the office or by phone by this Friday, September 19th. MSGL students get to play outside every day that the weather allows. This means their shoes can get wet and muddy. To avoid tracking that dirt onto the carpet, we ask that you provide your child with one pair of shoes to wear inside the classroom. These shoes will stay at school. Your child will probably change outdoor shoes with the seasons - from sandals to sneakers to snow boots - but indoor shoes can stay the same all year. Walking around in the classroom with bare feet is not allowed, so a comfy pair of shoes that the child enjoys wearing is a must. Below are some good examples of indoor shoes that work well for the children. These styles of shoes keep a child's foot dry from spills, are non-slip, stay attached to the foot, and they allow the child to get them on and off by themselves. Below are some examples of indoor shoes that DO NOT work well for the children. Slippers are not water-resistant and they can be difficult to walk in. If a child has not yet learned to tie, shoes with laces can be impossible for a child to get on and off by himself. Please save these types of shoes to wear at home. If you want to be sure your child's belongings find their way home, you can order personalized labels for shoes, clothing, lunch boxes, and etc. online. This year, we are partnering with Mabel's Labels for a handy fundraiser. During August and September, 2015, you can buy labels and MSGL will receive a percentage of your purchase price. Your thoughtfulness when shopping for indoor shoes will help put your child on the path to independence. Thank you! "No matter what we touch, an atom, or a cell, we cannot explain it without knowledge of the wide universe." The Elementary students present their space projects in these photos from 2000 - 2001. Stay warm out there and have a terrific Wednesday! 15 years ago the Lafayette Journal and Courier announced MSGL's plans to add an elementary program and move all of its programs to a new space. The Morton Community Center on Chauncey Avenue had been MSGL's home since 1985. As the article states, the new elementary program was originally going to be housed in a home on Rainbow Drive that had been donated by an MSGL family. A change of plans relocated that first class to some available classroom space inside the Temple Israel on Cumberland Avenue. In February 2001, all of our programs, from the parent-infant class through elementary, moved into our permanent home in the former Calvary Baptist church on Soldiers Home Road. In 2007, the elementary classes moved into the Montessori House, a remodeled home adjacent to the campus. MSGL has plans to expand once again in the near future to add a second toddler classroom and a gym/gross motor space.